The Myers-Briggs ENTP (Extroversion, Intuition, Thinking, Perception) personality type is the ultimate devil’s advocate, living to dismantle arguments, opinions, and beliefs, often for no reason. ENTP personality types are debaters. They enjoy sparring with others on a highly intellectual level. This outlet gives them an opportunity to display their natural quick wit, vast knowledge, and ability to use their intellect to connect abstract ideas that prove a point. Playing devil’s advocate stimulates ENTPs, because it helps them and others to observe and understand many opposing viewpoints. This exercise allows these individuals to become someone else, mentally, until they have proved their point or tired of the argument. When taking on this role, ENTPs automatically become the underdog, which they enjoy, because they find pleasure in questioning the status quo. They thrive off making others think differently and changing the direction of discussions. Their desire is to reconfigure existing systems or develop creative solutions to old problems. When it comes to executing and implementing their ideas and suggestions, they lack motivation, but they are content with that. They are more concerned with opening up other people’s minds than seeing their visions come to fruition. ENTPs are fantastic at brainstorming, so employers would be wise to utilize them in areas that call for process-improvements, and generating ideas and solutions. They typically have vivid imaginations, so their ideas usually exist on a grand scale. However, they do not like working on tedious and menial tasks, even if those tasks lead to their grand ideas. On the other hand, their best quality is that they challenge others to think alternatively and to combine understanding, empathy, consideration, and compromise, alongside logic, reason, and progress. Their greatest weakness may be that they worry too much or may become distant, overly emotional, and narrow-minded, when stressed. 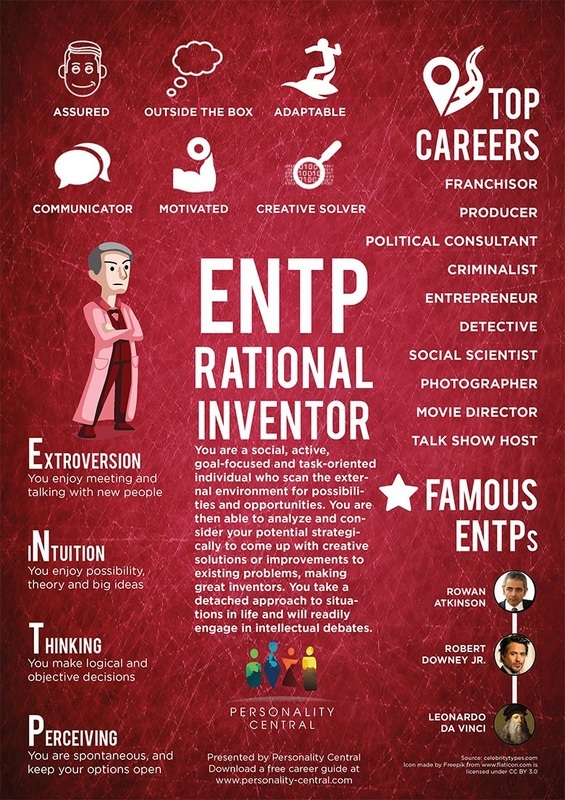 ENTP personalities make up approximately 3 percent of the general population, which is ideal, because they prefer to develop unique ideas and solutions, while more detail-oriented personalities implement those ideas. ENTP personality types tend to be straightforward when it comes to their expectations of themselves and their expectations of others in the workplace. These expectations can sometimes be impossibly high and hard to meet. In fact, these individuals have been known to expect their employees and co-workers to offer new and creative solutions to workplace problems. They also expect their ideas and suggestions to be heard and applied by others. They welcome debates amongst peers and will gladly accept constructive criticism—as long as it pertains to performance issues. Their love of debate can be an asset when examining an old problem or looking for ways to improve workplace processes; however, it can also be a detriment when challenging or questioning their bosses during meetings, or picking apart policies they do not agree with. ENTPs strive for honest, real, and direct interactions, which sometime cause them to come across as insensitive and condescending. They also value objective assessments of ideas, suggestions, and solutions. They are sincerely concerned with others thoughts and actions. Although ENTPs can appear stiff, arrogant, and formal to others, they know how to relax and have a little fun—even in the workplace. People who understand them tend to see them as humorous and charming. People with this personality type despise routine tasks. Supervisors should assign problem-solving roles and challenging tasks to these crafty individuals. They also like diversity, so monotonous tasks cause them to lose interest, which then causes them to get bored–-and quit. An ENTP’s biggest irritation is when people agree to perform a task and then later complain about it. In their minds, they believe that people should weigh all their options before agreeing on anything. They dislike when others are unwilling to speak up for better terms or resolutions. ENTPs are most successful in careers that promote their natural curiosities and abilities. Employers should utilize the never-ending ideas that flow from the minds of ENTPs. They should also utilize the spontaneity of those with this personality type. ENTPs value rational and logical thoughts, knowledge, deep insight, and creativity, which makes them great lawyers, psychologists, psychiatrists, social workers, scientists, and system analysts. They also excel as sales representatives and entrepreneurs. People with an ENTP personality believe that growth is the key to happiness and success at work and in relationships. In fact, even before a person with this personality type has found a partner, he or she has already imagined all the new experiences the two will share together. The reason for romantic relationships, to an ENTP type, is to grow together. If ENTP’s partners lack a desire for personal growth, the ENTP is quick to move on. However, ENTPs are known for high expectations, which can be overwhelming to a romantic partner who does not share these qualities. When an ENTP is able to find someone who shares his or her love of mental and emotional exploration, the experience can be remarkable. Partners should be wary, however, that ENTPs tend to test boundaries and push limits, observing reactions. This devil’s advocate always looks to open minds, and encourage spontaneity and objectivity. When ENTPs are in love, they are enthusiastic and creative, which makes for a good relationship. People with this personality type looks for ways to surprise and spoil their romantic partners. These individuals use their creativity to draw their loved ones toward them. ENTPs are loyal and supportive; however, they are also honest and direct, expecting their partners to be on a never-ending quest for self-improvement and enlightenment. For partners, this means that they may be subject to a considerable amount of criticism, in terms of personal growth. This characteristic can cause their partners to feel incompetent, unworthy, and deficient, which then causes serious problems in the relationships. ENTPs have to be cautious not to alienate partners and friends with their vigorous debates and insatiable need to be right. Not everyone relishes at the chance to debate others, and for those who do not, this personality type can be frustrating. When it comes to raising children, ENTPs tend to reject rules and regulations, so, they often allow their children to explore on their own, without restrictions and limitations. They encourage independence and advocate freedom of expression. As a result, ENTP parents typically provide an unorthodox home environment for their children that centers on excitement, joy, happiness, autonomy, and independent thinking. Furthermore, ENTP parents encourage their children to voice their opinions and to debate things that they think are unjust or simply wrong, also encouraging them to offer creative solutions to problems.